There are various things that you can try for the big night. You can try a minimalistic and subtle statement which speaks for you or also opt for a bold and dramatic outfit bringing out your stunning persona. Both these looks will get you the attention you are seeking. And one of the latest trends that can create a minimalist as well as a dramatic look at the same time is a lacey dress. Lace is a versatile fabric that can be used for simple, romantic, and elegant styles which resonate a minimalistic look. And at the same time, it can also create a gorgeous, head-turning number which will simply make everyone’s stare worthwhile. Don’t believe me? Well, here, we have put together a few beautiful lace prom dresses that will be perfect for both subtle as well as scintillating appearances. Check them out now. Do you want to flaunt your oh-so-gorgeous body this prom? Then, this lace and tulle combination dress will be great. It will have a detailed lacework on the overall torso area and will extend onto the lower half in an asymmetrical pattern. The dress will be sleeveless and the neckline will be a deep, plunging one. The lower half can be flared in tulle, sweeping across the floor when you walk. The dress will be an A-line style, cinched at the waist. Therefore, this dress is quite an elegant and simple one with minimal work and yet can bring out your silhouette in a great way. Another quite glamorous look that you can create this prom is a beautiful, white sheer lace gown. The dress is divided into two sections- the upper torso in sheer and the lower half in the normal fabric. The lacework will only be in the sheer section of the dress and the rest of the bottom half will be chiffon. The full-sleeves and the torso with a high collar neckline will be in sheer with white and silver lacework, leaving certain parts transparent. While the lower half is quite simple in its own, it will have a thigh slit, flaunting your toned, long and slender legs. 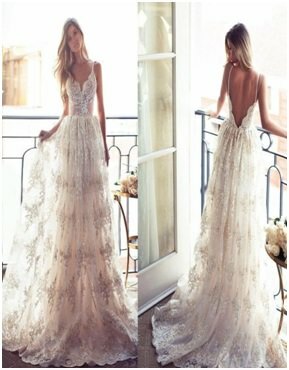 So, give every girl out there “glamour goals” with this unique lace style dress. Another pick that is trending at the moment for these kinds of lace dresses is a combination of both- enjoy the subtlety as well as the boldness in a long, full sleeve dress with a v-neckline and some lacey embellishments. Now the whole dress fits your silhouette perfectly, drawing attention to your perfect body. This is a very glamorous and bold look for the evening. But now you can also make it look minimalistic by adding a detachable skirt. You can wear it from your waistline and it will turn the dress into a formal, ballroom gown and yet the light and simple chiffon fabric will make it look very undertoned and simple. So, look for a company which can offer you some stunning red, purple, white, or burgundy prom dresses in remarkably trending styles today and grab the perfect prom look today.